This Beyhiver may have leaked the information, and if so get ready for the weekend! We have the release date, the song titles, and just one day left to secure our edges, because the Beyoncé album is incoming...first for Tidal users of course. Photo: tumblr With guest appearances from Mariah Carey, Nicki Minaj, and a long awaited collaboration with Adele, this album is already fire. 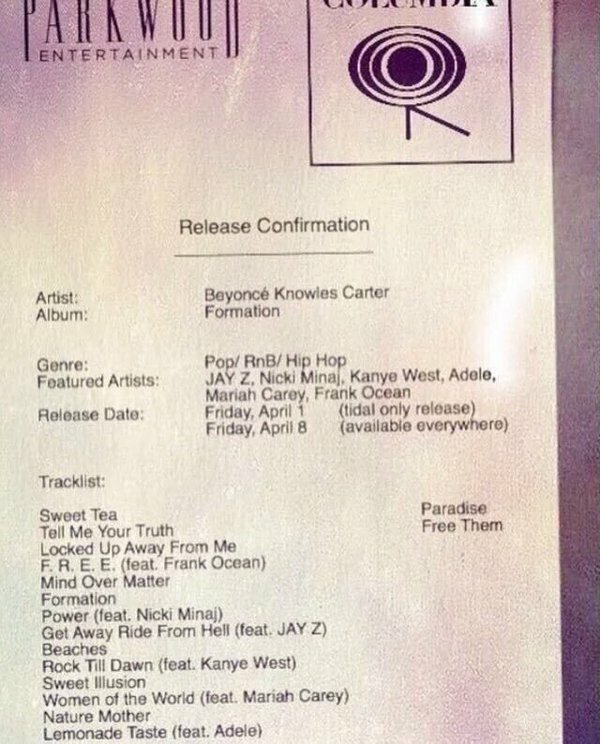 The album will be released on April 1st for Tidal users, and for the general public a week later on April 8th. This is all just in time for the Formation tour, which is set to kick off April 27th in Miami, Florida. And here is the confirmation. The weekend is finna be lit! Which song are you most excited to hear?